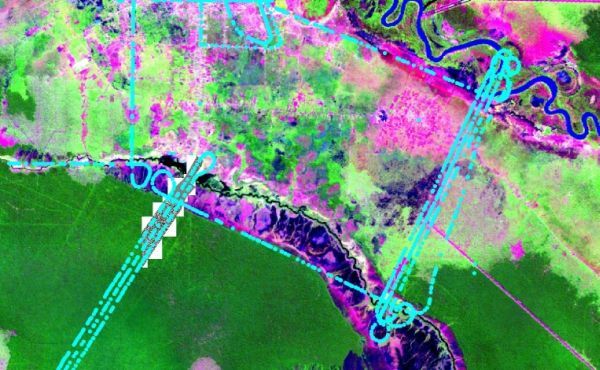 With a high-resolution Airborne Laser Scanner (ALS) the topography of peatlands were measured by a helicopter at the beginning of August 2007. 34 peat drillings were performed between Habering Hurung near to the Rungan and the Katingan River including ALS- and ortho-photo measurements. 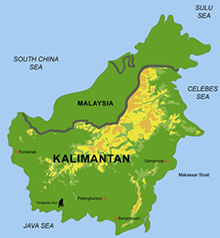 A 3-dimensional Digital Elevation Model (DEM) has been established for the Kalampangan Channel in Block C of the former Mega Rice Project and for a transect through the Natural Laboratory in the Sabangau National Park, starting from the Sabangau river, passing the base camp and reaching the peat dome. A transect was also analysed between the Rungan and Katingan Rivers. A hydrological model of peatland with biomass of peat swamp Forest (PSF) will be analysed by this modern technology with an elevation resolution of +/-15cm. Illegal channels in Peat Swamp Forest (PSF) were monitored. The first results of ALS- and ortho-photo measurements were presented.